Organizationally, J2 Innovations has been on an exciting hiring mission! As you’ve seen from previous blogs, we’ve added a number of team members to the North America Team. To kick things off, Ryan Schlotfeldt joined as our new V.P. of Sales Americas, followed by Erol Baki (Director of Business Development), and Cameron Munoz (Technical Sales Support Specialist). On the development side, we have created a unique organization designed to support our OEM partners through a new group called the “Glue Team”. 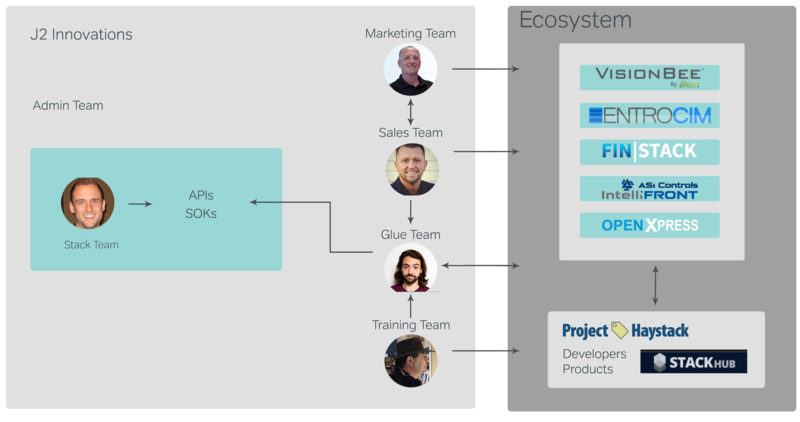 They are a dedicated group of developers who will stay sticky with our OEM partners and help them develop and adopt the FIN framework. We also added a number of senior and junior developers to the “Stack Team”, whose purpose is to stay focused on innovating the FIN Framework. This provides a highly focused organization best suited to meet both customer and development goals. We are grateful for our current OEM partners and FIN community. With the help of Project Haystack, there is a growing ecosystem of technology providers who add value to the FIN framework. We are well on our way to building an organization that combines marketing, sales, professional services, training, and innovative technology!